Here we go : we are very happy to announce that UGAL is now able to produce mobile friendly websites. Using Responsive Web Design techniques, the display of your website is automatically optimized for the screensize of the visitor's device. Our default theme, Red, has been upgrated to be responsive and the most used standard themes will be upgrated in the coming weeks. 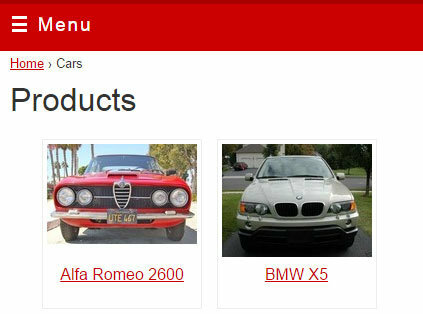 Custom themes can easily be upgraded to be responsive. Today, about 35% of the traffic on UGAL comes from mobile devices : 20% from smartphones and 15% from tablets. Desktop traffic still dominates at 65%, but it is not going to last and the share of mobile will continue to grow. It is time for UGAL to specifically address the needs of those visitors with smaller screens. Being a bit late to the mobile party gives us a strong advantage: choosing among mobile technologies is far easier today than it was 2 or 3 years ago. That is why we have chosen to extend UGAL with support for responsive web design. The changes will be available in the next few weeks. UGAL makes content categories available for news, FAQs, portfolio and products modules. 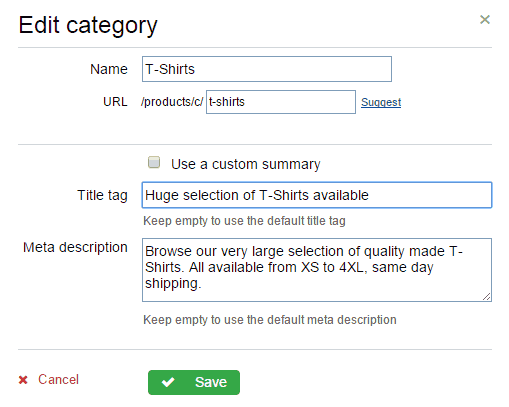 Providing title and description meta data to your category pages is great for search engine optimization. We are very happy to announce that the payment platform Stripe is now available for all UGAL e-commerce websites. Stripe is a great choice for your e-commerce website because it allows your customers to pay for their orders without leaving your website and with the confidence that their credit card data is kept secure. Our customers appreciate the ability to manage their newsletter subscribers and send newsletters directly from their website, without the need to use a third party service and at no extra cost. We are pleased to announce that the newsletter module was just updated with better options for scheduling newsletters. UGAL was just updated with a security related update, and all requests for pages containing sensitive information are now secured with https. Requests for sensitive pages on your custom domain name (eg http://www.domain.com/login) are now automatically redirected to their secure version hosted on a sub-domain of ugal.com (eg https://sitename.ugal.com/login). We are very happy to launch today a redesign of the admin interfaces you use to manage the content of your website. During the 8 years UGAL has been around, our various interfaces evolved in different directions and it was time to consolidate them all under the same design. Be ready next time you login to your website : it looks different ! Good things going on today with the availability of a much better Universal Analytics integration for our e-commerce websites. Using Analytics measurement protocol, UGAL is now able to always report confirmed orders to Analytics, regardless of where the order payment happened (onsite or with a payment processor). Confirmed orders pageviews are now sent to Google's servers even if the customer does not return on your website after completing an external payment. Also, UGAL now gives you the option to share your e-commerce data with Analytics. If you want to, UGAL will send anonymized order information to Google's server so that you can use Universal Analytics interface to analyze your sales. All websites have been configured to NOT send e-commerce data to Analytics by default. With the recent support for Universal Analytics, it is a good time to start supporting more Analytics features to give you an even better idea of how your visitors interact with your website. We start today with support for Analytics Events and we get ready for e-commerce related changes coming very soon.